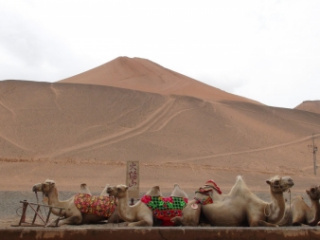 Just the words Silk Road conjure images of romantic oases, dusty caravans, and the mystery of far-away places. It was not just a single thoroughfare, but an intricate network of trade routes that spread across Central Asia passing through those oasis villages and cities and stretching from the farthest reaches of China into Southern Europe. Various routes criss-crossed Eurasia, the Middle East, Central Asia and the Far East. Those dusty caravans carried exotic trade goods, yet far more importantly, they carried an exchange of ideas, information and culture. These complex overland routes gained their name from the most famous of luxury items: silk. Both cloth and currency, it was a guarded secret for centuries in China and the rest of the world paid dearly to obtain it. The Romans paid its weight in gold! By about 300 AD, it was produced in India and by 550 AD had made its way to the Byzantine Empire and from there on to Europe. Tales of smuggled silkworms, court intrigues, sly monks and oriental princesses weave a cocoon of legend around the history of silk. In addition to silk, other precious commodities made their way along this route. Traders from the west carried gold and other precious metals and stones, ivory and glass. In the opposite direction came furs, ceramics, jade, bronze objects, lacquer and iron. Pomegranates, carrots, apricots and safflowers enhanced the cuisine of the east. Amber, myrrh and frankincense enriched foreign courts. Elephants, peacocks, leopards, yaks and horses made the trip. Even the ubiquitous apple had its start in the forests of Central Asia! Many of these goods were bartered for others along the way, and objects often changed hands several times raising the value. Few merchants would travel the full length of the road, most sold their wares at some distance from home, then returned with the profits and start out again the next year. Settlements grew up along the way and profited financially and culturally from the passing trade. Their names are the stuff of legends; Constantinople, Taraz, Samarkand, Tashkent, Bukhara, Urumqui, Turpan. They were open to influences from all the major world civilizations of the times. Zoroastrianism, Buddhism, Islam and Christianity crossed these routes of distance, language and ethnicity as did Chinese ingenuity, Mongol armies, Middle Eastern architecture and European mercantilism. The origin of globalization has left a lingering legacy for us today. Journeys on the Silk Road routes could take a year or more through less than hospitable landscapes. Formidable obstacles included cutthroat bandits and evil khans, the Taklamakan Desert "of no return" and the impenetrable passes of the Pamir Mountains. Today's intrepid travelers complete these distances in days or hours on modern motor, train and airplane routes. We can trace the paths of caravans, conquerors, explorers and emperors; of Tamerlane, Alexander the Great, Marco Polo, Chinggis Khan, the Russian tsars and Soviet politicians. 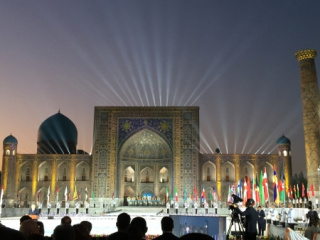 Long hidden from the West, the recently independent republics of Uzbekistan, Kazakhstan, Kyrgystan, Turkmenistan and Tajikistan welcome visitors to this last great frontier of travel! Immerse yourself in legend and feel the pulse of civilization as you explore the treasures of the Silk Road; the bridge between East and West, between history and today.